In an investigation of Renaissance-period Venetian glassblowing techniques, the subject on which this resource is based, one question reasonably comes to mind: Why not ask a maestro practicing his craft today how all of this was done? Wouldn’t he know? After all, with a tradition dating to the seventh century, are we not witnessing living links with the past in an unbroken chain when we visit a Muranese glass factory? The answer cannot be supplied with a simple yes or no. The answer is also “no,” however. As we will see, if we look closely enough at objects from both earlier and later periods of production, a consistent pattern of differences in the way they were made begins to emerge. Therefore, a thorough answer to the question requires some consideration. 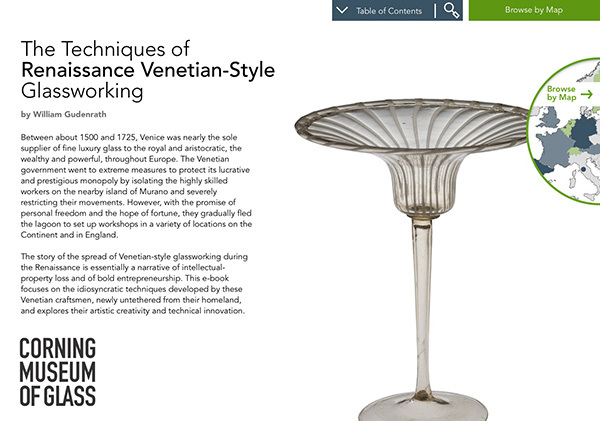 In an earlier section of this resource (see An Historical Overview of Glassblowing in Venice: Period of Pan-European Dominance), we saw the Venetian glass industry flourish, then weaken nearly to the point of disappearing altogether, and at last revive gradually and flourish again. It was not until decades later, the historical record indicates, that a thawing of the long, barren winter for Venetian glassworking occurred. As was described earlier (See An Historical Overview of Glassblowing in Venice: Revival and Continuing Influence), successes began to arise around the middle of the 19th century with the revival of filigrana techniques and the beginning of the making of calcedonio glass. At that same time, glassmakers regained much of the virtuosity required for the creation of complicated forms with the use of light filigree morise (ornamental bit work). During the ensuing decades, the Venetian glass industry once again found itself very much in demand for work that was considered to be fashionable. What about the interregnum, those seven or eight decades between the gradual decline of the Venetian glass industry in the late 18th century and its rebirth in the second half of the 19th century? If the technical demands on generations of workers were reduced to the making of only simple domestic wares, could the myriad secrets of virtuoso glassblowing really have survived without actually being practiced? Probably not. It seems more likely that most of the sophisticated techniques that had been invented and mastered during the Renaissance were gradually reinvented by clever, motivated workers. Under the direction of factory owners and local leaders such as Abbot Vincenzo Zanetti (1824–1883), founder of the Murano Glass Museum in 1861, there must have been an almost nationalistic urge to re-establish Venice as Europe’s premier glassmaking center. For an account of the period of crisis, see Rosa Barovier Mentasti, Il vetro veneziano, Milan: Electa, 1982, pp. 179–183.